I’m always look forward to getting a stollen in December every year. 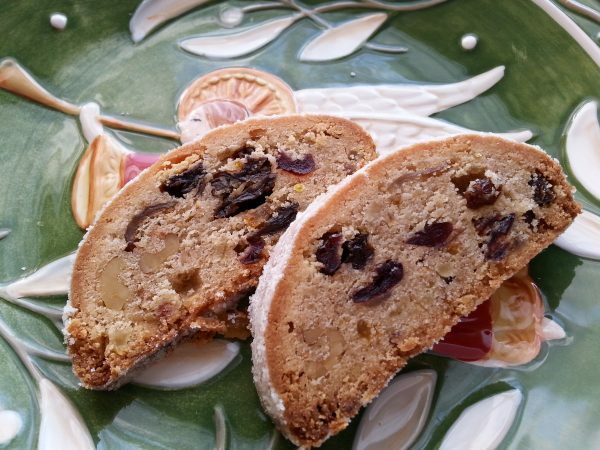 Stollen is a traditional German sweet for Christmas. Recently it is getting popular in Japan too. The main ingredients are dried fruits, nuts, butter, flour and sugar. As it is quite sweet, I cannot finish it all in one time. I usually cut a thin slice and eat it little by little during Christmas. It is said that there is an ageing effect in the stollen. And I often found that its taste gets better near the end. The birthplace of the stollen is said to be from Dresden, Germany. In order to maintain the traditional taste and quality, undercover agents are sent to check the taste of the stollen in each shop in Dresden. My favorite stollen is my local bakery’s. I buy a stollen every December. Although I have tasted many stollens from different shops, I think the ones from my local bakery is the best!